Minister of the Congregational Church, President of the South African Native Convention, he led a deputation to London to protest the Native Land Act of 1913, first African ever to be elected to serve as a member of the Cape Provincial Council, Vice-President of the ANC,teacher, writer. After acquiring primary school education, Rubusana was admitted to Lovedale, the Free Church of Scotland mission school on the banks of the Tyhume River. There, under the tutorship of Dr James Stewart, he studied for the Cape Teachers' Certificate, passing the final examination with distinction in 1878. Instead of going out to teach, he remained at Lovedale to study Theology under the guidance of Dr Stewart and the Reverend Andrew Smith. In 1880 Rubusana left Lovedale to take up a teaching post at the Peelton mission station, where he also worked as assistant Pastor. It was at this post, in 1883, that he married Deena Nzanzana, his first wife; together they had five daughters and a son. He remained at Peelton until his ordination as a minister of the Congregational Church in 1884, at which time he transferred to East London, which was to be his home for the rest of his life. Rubusana was very much involved in political activity in the early 1900s. Despite being radical, Rubusana and his associates could not see beyond British Imperialism. During the Anglo-Boer War they all threw their support behind Britain. Rubusana and other ministers of religion lent their moral authority to enlisting African labourers, wagon drivers, scouts and hundreds of other non-combatants to contribute towards the British victory, which finally came in 1902. The other important formative influence on Rubusana was his religion. He was a dedicated minister of the Congregational Church, participating in its councils and actively involved in proselytising its message to the African people. He translated a number of Congregational texts into Xhosa, and was also active in the Native Education Association, led by Elijah Makiwane. As the descendant of a respected traditional statesman. As a recognised authority on the Xhosa language, he was appointed to serve on the Xhosa Bible Revision Committee, set up to refine the translation supervised by Tiyo Soga in the 1850s. He personally supervised its publication in Britain when he accompanied the Thembu king, Dalindyebo, to attend the coronation of King Edward VII in 1904. During his stay in London he also published his first book, Zemk' Inkomo Magwalandini (Defend Your Heritage), an anthology of traditional epic poetry, didactic Christian essays and Church history. As one of the earliest collections of the oral poetic tradition, the book has inestimable historical and literary value. Zemk' Inkomo Magwalandini reflects on the two dimensions of Rubusana's political thinking. He was a committed modernist, represented by his espousal of Christianity and Western education, while at the same time recognising that there were a number of abiding values in traditional African society. By the end of the decade (1900-1910) Rubusana was universally recognised as one of the leading black politicians in South Africa. Amongst Africans, his status was second only to that of John Tengo Jabavu. Thus, when Jabavu withheld his support from the South African Native Convention, which met in Bloemfontein in 1909, it was natural that Rubusana was chosen as its President. In this capacity he led the black deputation to London in June of that year. The deputation to London was a historic landmark, being the first occasion during this century that Africans and Coloureds formed a united front in pursuance of common objectives. Rubusana was accompanied by Dr A. Abdurahman, leader of the African People's Organisation (APO), D Dwanya, Matthew Fredericks, John T Jabavu, D J Lenders, Thomas Mapikela and one white parliamentarian, W P Schreiner on the deputation. Alfred Mangena, who was living in London, also joined the deputation. Rubusana returned home with his deputation in September 1909 to report that they had been unsuccessful. White South Africa duly marked the unification of the four colonies with great pomp and ceremony in May 1910. The deputation had had two main objectives - reversal of the 'colour bar clauses' and preventing the incorporation of the three British territories (Lesotho, Botswana and Swaziland) into the Union until the white public foreswore racism. Everyone they met listened politely to their arguments, but at the end of the day the Act of Union was passed, with the 'colour bar clauses' intact. The deputation did succeed however in preventing the absorption of the High Commission territories. During the same year, Rubusana announced his candidacy for the Thembuland constituency in the Cape Provincial Council as soon as the elections were announced. Many who had mouthed sentiments of racial equality now joined the ranks of the arch-racists to denounce Rubusana for daring to contest the seat. Richard Rose Innes, the Independent Liberal politician and a long-time backer of Jabavu's, recorded his disapproval in the East London Dispatch. All these impediments not withstanding, W B Rubusana ran a most effective campaign. His contacts in the church and its related organisations provided a ready-made network to mobilise the voters; the SANC branches throughout the Cape and the newspaper Ilizwi Labantu provided rallying points for his supporters. When the results were announced on September 21, Rubusana had won the seat and become the first African ever to be elected to serve as a member of the Cape Provincial Council. The event caused quite a stir in South Africa. In 1911 Rubusana made his third voyage overseas to attend the Universal Races Congress in London. The conference, organised by the Ethical Culture Society to discuss race relations throughout the world, had attracted numerous participants from the United States, Asia and other parts of Africa. Among the American participants was Dr. W E B du Bois, the father of Pan-Africanism. 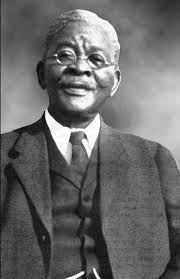 At the time he was engaged in setting up the National Association for the Advancement of Coloured People in the United States. Here Rubusana had the opportunity to rub shoulders with many of the leading black political figures of the world, exchange experiences, and broaden the international contacts of the South African movement. Rubusana returned home convinced of the need for a national organisation. He and his colleagues had attempted to create such a movement in 1902, but had not been able to extend beyond the boundaries of the Cape. The idea of setting up a national organisation had been placed before the deputation to London in 1909 by Pixley Ka Isaka Seme and was implemented in late 1911. Rubusana was one of the hundred delegates who went to Bloemfontein on 8th January 1912 to attend the inaugural conference of the African National Congress. As an experienced political campaigner, he was appointed on to the constitutional commission chaired by Richard Msimang, and elected as one of the Vice-Presidents of the ANC. Rubusana was involved in every aspect of the Anti-Land Act Campaign which was an attack on the Native Land Bill of June 1913. He featured prominently in every stage of its development. When the deputation to London was chosen he was amongst them. Rubusana and others arrived back in South Africa shortly before the outbreak of the First World War. In 1914, Rubusana experienced a personal political defeat. When his term of office in the Cape Provincial council expired that year he decided to contest the seat once more. However on this occasion an old colleague John Tengo Jabavu, took the field against him. The two men had been opponents in many campaigns and had experienced numerous differences of opinion over the years. John Tengo Jabavu was awarded the position. During the First World War (1914-1919), Rubusana personally offered his services to recruit 5,000 men provided the government was prepared to train them in modern warfare. The ANC leaders undertook to suspend all their campaigns and mass agitation for the duration of the war as a demonstration of loyalty. Smuts, on behalf of the government, thanked them for their declarations of loyalty but declined Rubusana's offer with words to the effect that since this was a "White man's war" he saw no reason why the Africans should take a hand in the fighting. Rubusana died on 17th April 1936 in East London at the age of 78. • Potgieter, D.J.et al. (eds). (1971). Standard Encyclopaedia of Southern Africa, NASOU: Cape Town.v. 3, p. 620.